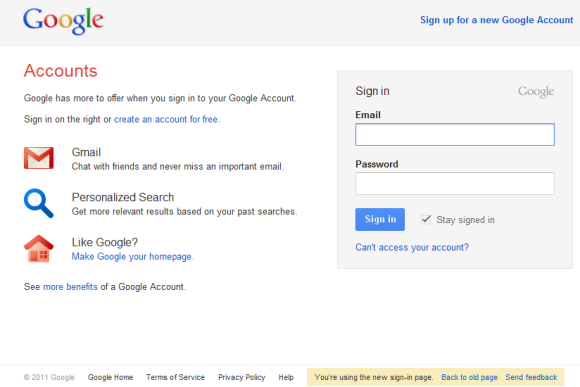 It's probably the first time when Google tests a new sign-in page by asking users to try it. If you go to Gmail and you aren't logged in, you should see a message at the bottom of the page: "Coming soon: A new sign-in page! Preview it." When you click "Preview it", you'll see a new sign-in page that uses the Google+ design. If you opt-in to the new interface, the sign-in pages for Google Docs, Google Reader and all the other Google services will also change. "For a limited time, you can switch back to the old version of the sign-in page by clicking the link at the bottom of the page. 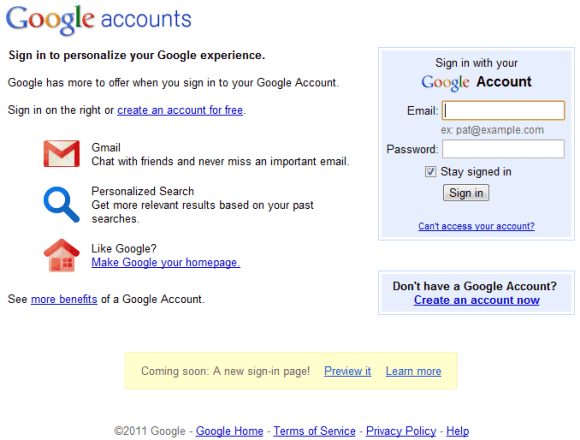 However, eventually this change will be permanent and you will not be able to switch to the old look," informs Google. The new input boxes are a lot bigger: you can type 31 characters in the username box and they're still visible. In the old interface, only 20 characters from the username were visible at a time. I don't have a message at the bottom of the page: "Coming soon: A new sign-in page! Preview it." When you click "Preview it". I hate the red buttons in gmail, and in every other product of google, It is intrusive. The terminology used in this article is incorrect. It says "soon-to-be-deprecated interface", however it is already deprecated. Perhaps the author meant "soon-to-be-replaced". This has to be the most anti-climactic change ever. whoopity-freakin-doo. And for those that don't like the red buttons, you are entitled to your opinion, but "intrusive'? really? perhaps you should consider getting a grip. It's just a button in one of the three primary colours. Methinks people are a little too sensitive these days. I disagree. The new UI is opt-in, so it's not enabled by default. I wouldn't call the existing interface deprecated as long as it's still the default interface and you need to click a link to preview the upcoming UI. Google is also testing an experimental account chooser page that you can opt-in to. It will keep a list if the different accounts you use and list them on the sign in page. If you follow the link from @Dave it turns the new page on for you until you turn it off. I like it! I can't say that I see any "must-have" feature, but in terms of looks I think it's nice. 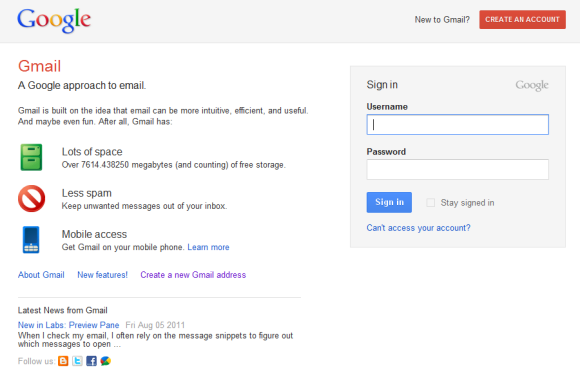 It's nice but I prefer the traditional Gmail logo instead of Gmail written. When Google asks you to relogin, and presents you with a page with your email address already filled in, then it ALWAYS asks me to re-enter that address after I type in my password and hit Submit. That field is not editable, so I just reenter my password and it works the second time. It's been like this for months. Doesn't anyone at Google every use their own software? Anonymous August 13, 2011 12:41 PM: "it ALWAYS asks me to re-enter that address"
I don't know, but maybe this will help you? Thanks for the link...Love it..
You have similar links to the experimental search ? It doesn't address the issue I described. My correct email address is already visible and uneditable. There are no captcha fields.